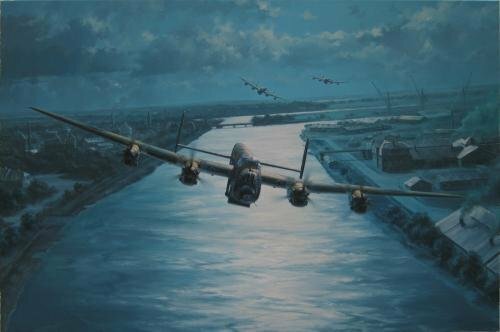 Flying at altitudes as low as fifty feet, Lancasters of 617 Squadron follow the Dutch canals en-route to Germany - their target, the mighty Dams of the Ruhr - on the night of the 16 / 17 May 1943. At such low level the pilots of many of the specially modified Lancasters found their flying skills tested to the extreme as they were forced to take violent evasive actions when they encountered flak, large electricity pylons and tall trees, but several of the gunners in the crews still managed to shoot up and damage a number of trains on the way. Each copy of En-Route is individually signed by two eminent Dambuster veterans, together with the artist, Anthony Saunders. Each print is hand numbered.